The prevalence of congenital anomalies of the central nervous system varies in different epidemiologic studies, mostly as a consequence of the type of ascertainment and the length of follow up. The clinical role of sonographic biometry of the fetal cranium is well established. Biparietal diameter, head circumference, and transverse cerebellar diameter are currently used for assessing gestational age and fetal growth and identifying cranial abnormalities (see chart below). Modern high-resolution ultrasound equipment yields a unique potential in evaluating normal and abnormal anatomy of the fetal neural axis beginning at very early stages of development. Ultrasound technology has improved remarkably since maternal serum alpha-fetoprotein (MSAFP) screening was adopted. Centers with special expertise in obstetric ultrasonography report excellent sensitivity and specificity in detecting fetal neural tube defects (NTDs). In the hand of experienced operators, ultrasonography alone has up to 97% sensitivity and 100% specificity in the diagnosis of NTDs (1). In less experienced hands, however, ultrasonography is only a screening test that can have a high false-negative rate. To take advantage of both types of testing and to minimize risk, many centers now offer specialized ultrasound examinations initially to all high-risk women, and perform amniocenteses only in a subset of patients. The purpose of this document is to discuss the role of ultrasound in identifying neural tube defects (NTDs). Anencephaly and spina bifida comprise the majority of neural tube defects. In the 20 plus years since maternal serum alpha-fetoprotein (MSAFP) was recommended in United States for the general population, significant changes in the use of ultrasound and better understanding of the factors that place a woman at increased risk of bearing a child with spina bifida (and thus a candidate for diagnostic testing and not screening) have changed the utility of MSAFP screening. Amniotic fluid evaluation of alpha-fetoprotein and the role of fetal surgery for NTDs are also discussed. Transvaginal high-frequency high-resolution probes reveal surprising details of the developing cerebrum. 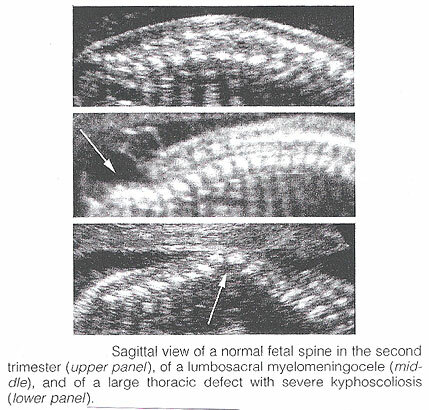 At 7 weeks gestation, a sonolucent area is seen in the cephalic pole, presumably representing the fluid-filled rhombencephalic vesicle. At 9 weeks, the convoluted pattern of the three primary cerebral vesicles is demonstrated. Starting at 11 weeks of gestation, the brightly echogenic choroid plexus filling the large lateral ventricles are the most prominent intracranial structures. In the early second trimester, the lateral ventricles and choroid plexus decrease in size relative to the brain mass. Although many scanning planes along different orientations are possible and may be required from time to time to better define subtle details of intracranial anatomy in selected cases, a satisfying survey of brain morphology for the purpose of routine screening can be achieved by two transverse axial planes, which are easily and rapidly obtained in most pregnancies. From rostrad to caudad, these views demonstrate the lateral ventricles and choroid plexus, the diencephalon and surrounding structures, and the posterior fossa. Coronal and sagittal views are more difficult to obtain but may become necessary in targeted examination for a proper evaluation of the midline structures as well as to assess the symmetry of the two hemispheres. Population screening methodologies such as maternal serum screening studies and routine second trimester sonography are not appropriate for women at increased risk of bearing a child with neural tube defects. In these women, diagnostic studies should be considered (2). Confirmation of the presence of an open spina bifida relies on the same ultrasound findings, however, diagnostic studies should also include identification of the lesion level and whether there are associated abnormalities. The anatomic lesion level is defined as the upper level of the spine that shows disruption of the skin overlying the defect. Landmarks such as identification of the 12th rib allow the sonographer reasonable accuracy in pinpointing the highest affected level. It has been demonstrated that ultrasound is accurate to within one vertebral level of the anatomic level (3). In uncertain cases, when the diagnosis of spina bifida is unconfirmed by ultrasound but suspected, amniocentesis can be offered. Analyzing the level of amniotic fluid alpha-fetoprotein (AFP) and acetylcholinesterase measured against standards for gestational age can offer more certain diagnoses. Anencephaly: It is characterized by the absence of the cranial vault and telencephalon. Necrotic remnants of the brain stem and rhombencephalic structures are covered by a vascular membrane. Associated malformations are common and include spina bifida, cleft lip/palate, clubfoot, and omphalocele. Polyhydramnios is frequently found. The diagnosis is easy in the midtrimester and relies on demonstration on the absence of the cranial vault. 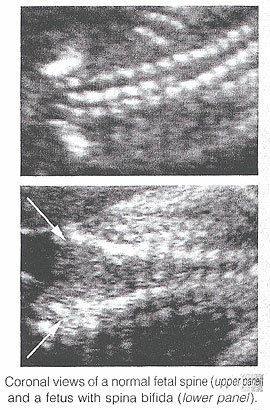 Although fetal head can be positively identified by vaginal sonography as early as the 7th week of gestation, the diagnosis may be difficult in the first trimester. Anencephaly is considered to be the final stage of acrania, as a consequence of disruption of abnormal brain tissue unprotected by the calvarium. Most anencephalics have normal eyes. The forebrain is replaced by an angiomatus mass with multiple cavities containing cerebrospinal fluid. This highly vascularized neural and mesenchymal tissue is known as the area substantia cerebrovasculosa. As such, a cephalic pole, albeit overtly abnormal, is usually present in early gestation. Thus, the examining sonographer should not be dissuaded from the diagnosis of anencephaly by the presence of tissue above the orbits. 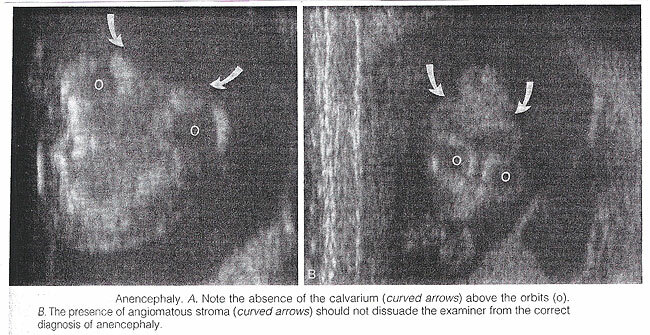 Before 10 to 11 weeks, the diagnosis may be difficult because of a lack of complete calcification of the calvarium. Spina Bifida: It is commonly subdivided into occulta and aperta. Spina bifida occulta is characterized by a vertebral schisis covered by normal soft tissues. Large defects are usually associated with pigmented and dimpled lesions overlying skin and subcutaneous lipomas. Spina bifida aperta is a full thickness defect in skin, underlying soft tissues, and vertebral arches, exposing the neural canal. The defect may be covered by a thin meningeal membrane (meningocele). 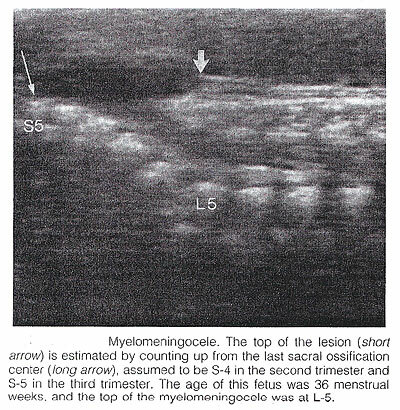 In the presence of neural tissue inside the sac, the lesion is defined as myelomeningocele, a term often used to indicate all cases of spina bifida aperta. The defect may vary considerably in size. The lumbar, thoracolumbar, and lumbosacral areas are most frequently affected. Spina bifida occulta is usually unpredictable with antenatal sonography, with the possible exception of the rare cases associated with large subcutaneous lipomas. Conversely, spinal bifida aperta can be diagnosed as early as the midtrimester. In the sagittal plane, the normal spine appears as two parallel lines formed by the vertebral bodies anteriorly and the ossification centers of the lateral processes converging in the sacrum. The lines correspond to the posterior elements of the vertebrae and the vertebral body. With spina bifida, the posterior line and overlying soft tissues are absent at the level of lesion. A meningocele may also be present, and in this case a thin-walled cyst is seen on the top of the lesion. Sagittal scans are also useful for evaluating the spinal curvatures that may be exaggerated with large spinal defects. Additionally, sagittal views are most useful in assessing the severity and location of the lesion. The top or the most cephalic extent of the bone malformation in spina bifida is often referred to as "the level of the lesion". This level can be determined by counting up from the last ossified vertebral segment (assumed to be S4 in the second trimester and S5 in the third trimester). If it is technically difficult to assess the lower spine, one can assume that the last rib indicates T12 and the top of the iliac wing indicates L5 to S1. In the coronal plane, the normal spine appears as three parallel lines. Distortion of the vertebral architecture with spina bifida results in disappearance of the central line and widening of the two external lines. In the transverse section, the three ossification centers of the developing vertebrae can be seen surrounding the neural canal. In the presence of defect, the lateral processes are splayed apart, and the neural canal is exposed posteriorly. The skin and muscles above the defect are absent. A meningocele is frequently present. Closed spinal defects are extremely difficult to diagnose. Examination of the fetal head can assist the sonographer in the difficult task of diagnosing open spina bifida, because this lesion is consistently associated with easily recognizable cranial lesions. Choroid plexus cysts: prenatal sonographic identification of choroid plexus cysts has been reported with increasing frequency over the last years. Survey of the low-risk pregnant patients indicates that the frequency of this finding in the midtrimester is approximately 1%. There is no doubt, that choroid plexus cysts are an indication for a detailed evaluation of fetal anatomy, including echocardiography. Whether a fetal karyotype should be recommended for isolated choroid plexus cyst is controversial, and some strongly oppose it. The rationale is that the available evidence suggests that choroid plexus cysts are associated with an increased risk not of trisomy 21 but mostly trisomy 18, which is a lethal condition, and that in most cases of trisomy 18 anatomic deformities will be detected by ultrasound (80% to 90%). It has been estimated that the likelihood of trisomy 18 in the absence of ultrasound evidence of fetal malformation is 1.5. From time to time, suggestions have been made that the risk of aneuploidy is related to the size of the cyst, whether it is unilateral or bilateral, and whether it is persistent or disappears. From the available literature, no evidence supports any of these suggestions (5). Small cyst, unilateral cyst, and transient cyst have all been documented in association with aneuploidies. In the absence of associated anomalies, choroid plexus cysts should be considered as normal anatomic variants. A handful of vary large cysts of the choroid plexus causing intracranial hypertension have been described in the neurosurgical literature, but these probably represent a separate clinical entity. One advantage of amniocentesis under ultrasound guidance, is that amniotic fluid also can be obtained for determination of the fetal karyotype. Several studies suggest the elevated MSAFP levels independently increase the risk of fetal aneuploidy. In pregnancies complicated by an elevated MSAFP level, the incidence of fetal aneuploidy is 0.61% in ultrasonographically determined normal fetuses and 16% in abnormal fetuses. Performing a genetic amniocentesis in all women at increase risk of an NTD would result in a 98% detection rate for NTDs and a 100% detection rate for aneuploidy. However, based on the high false-positive rate of the MSAFP screening test, a policy of universal amniocentesis for all high-risk women would mean many would undergo amniocentesis unnecessarily (6). Amniotic fluid and maternal serum alpha-protein (MSAFP) levels are elevated in 89-100% of pregnancies complicated by fetal NTDs. Many large prospective trails of MSAFP screening have shown the most affected pregnancies can be identified by an elevated MSAFP level, usually defined as more than 2.5 times the normal median for singleton pregnancies. Because more than 90% of all children with NTDs are born to women with no family history of NTD and no obvious risk factors, MSAFP screening -- which usually is performed as part of broader screening for aneuploidy -- makes it possible to identify affected fetuses in such women. Most screening programs strive to identify most cases of NTDs without unduly increasing the false-positive rate, which requires a trade-off between sensitivity and specificity. When the screen-positive cutoff is set at 2.5 multiples of the median (MoM), the screen-positive rate is typically 5% or less, and approximately 85% of all NTDs in singleton pregnancies and 80% in twin pregnancies will be identified. The false-positive rate can be decreased by performing an ultrasound examination before MSAFP screening to verify gestational age and identify multiple gestations and cases of intrauterine fetal demise (7). Although second-trimester amniocentesis is a relatively safe procedure, it is associated with a post-procedure pregnancy loss rate of approximately 1 in 200 (8). Many high-risk patients decide against amniocentesis after a reassuring specialized ultrasound examination. Alternatively, amniocentesis is offered for confirmation to those patients in whom visualization of the fetus is suboptimal and the ultrasound examination is not helpful in making a diagnosis. Women with a very high MSAFP level also may be offered amniocentesis because there is direct relationship between degree of MSAFP elevation and the incidence of anomalies. With an MSAFP of 2.5 MoM, there is a 3.4% risk of anomalies; at 7 MoM, the risk increases to 40.3%. Approximately 220 in utero closures of fetal spina bifida were performed in four centers in the United States between 1997 and 2002. These procedures were not performed as part of randomized study and generally were offered to women whose fetuses had lesions at or below the lower thoracic spine. Data gathered from this cohort suggest no improvement in bowel or bladder function or ambulatory ability beyond the degree of impairment predicted by the level of the lesion (9). However, these children appear to require shunt replacement less frequently or at least later in life. They also seem to experience an improvement in the degree of hindbrain herniation after in utero surgery, which, if confirmed, might help to prevent serious morbidity or mortality from worsening Arnold-Chiari type II malformation. Because of selection bias in the cohort and the non-standard neurosurgical follow-up, it is difficult to know whether the medical need for shunting truly decreases or whether decreased herniation corresponds to improved function (10). Maternal-fetal surgery is a risky procedure. The woman incurs the risks attendant with any surgical procedure (anesthetic complications, hemorrhage, bladder injury, chorioamnionitis) twice during the index pregnancy. First, a hysterotomy is placed in the muscular portion of the uterus during the late second trimester to provide access to the fetus. Because the hysterotomy confers and increased risk of uterine rupture, the woman then must undergo cesarean delivery for the index and all future pregnancies. One of the most significant potential risks to the fetus is preterm delivery and its secondary complications. A fetus that has undergone in utero neurosurgical repair is delivered at approximately 33 weeks of gestation, with up to 40% being delivered before 32 weeks of gestation. Information on long-term complications for women and fetuses who undergo maternal-fetal surgery is only starting to accrue (11). The parent(s) must understand these risks and recognize the potential for additional complications before undergoing such a procedure. The ethical issues relevant to maternal-fetal surgery for fetal spina bifida are complex, and maternal-fetal surgery for repair of fetal spina bifida currently is considered investigational. A National Institutes of Health supported prospective randomized trial of prenatal surgical closure of fetal spina bifida began in January 2003 and is expected to resolve many of these issues (12). Fetuses with spina bifida are diagnosed commonly such that it is now unusual for a woman who is receiving prenatal care in the USA to receive the unexpected diagnosis in the delivery room. It is likely that as an increasing number of women undergo first trimester ultrasound in the setting of nuchal translucency screening, there will be an increased identification of fetuses with neural tube defects diagnosed in the first trimester. Policy decisions regarding performing a routine ultrasound will certainly have an impact on the detection rate of spina bifida. A decision about invasive testing can be made that takes into account the degree of risk associated with the MSAFP level or the patient's history, the quality and findings of the specialized ultrasound examination, the patient's age, and the patient's wishes. Some women at high risk for a fetal NTD may choose amniocentesis because they also are at increased risk for fetal aneuploidy. Some authorities dispute the use of ultrasonography as a diagnostic test and recommend that amniocentesis be offered to all women with elevated MSAFP. Once spina bifida is diagnosed, it is critical that a complete diagnostic evaluation be performed so that the family can be advised of the condition of their fetus. Rapid referral to a diagnostic center following prenatal detection of either a risk factor or the presence of spina bifida is critical. If this decision is to continue the pregnancy, accurate counseling with pediatric neurologists and neurosurgeons as well as coordination of care with local spina bifida clinics can be established early on. Women with elevated AFP levels should have a specialized ultrasound examination to further assess the risk of NTDs. The fetus with an NTD should be delivered at a facility that has personnel capable of handling all aspects of neonatal complications.